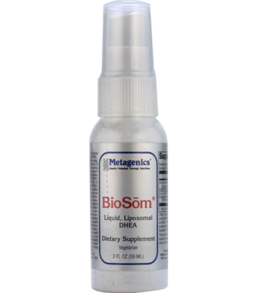 BioSom® is an easy-to-use liposomal form of dehydroepiandrosterone (DHEA). Liposomal liquid allows for flexible, convenient dosing of DHEA. May promote patient compliance in those who have difficulty swallowing tablets or capsules. Other Ingredients: Purified water, castor oil, polysorbate 60, natural flavors, benzyl alcohol, sorbitan stearate, potassium sorbate (as preservative), lecithin (soy), xanthan gum, and disodium EDTA (preservative). Contains: soy. This product is produced in a facility that produces products containing wheat, soy, egg, fish, crustacean shellfish, nuts, and tree nuts. DIRECTIONS: Shake well before using. Spray in mouth and mix with saliva for 20 seconds, then swallow. Take one serving one to four times daily in divided doses or as directed by your healthcare practitioner. NOT FOR USE BY INDIVIDUALS UNDER THE AGE OF 18 YEARS. DO NOT USE IF PREGNANT OR NURSING. Consult a physician or licensed qualified healthcare professional before using this product if you have, or have a family history of, prostate cancer, prostate enlargement, heart disease, low “good” cholesterol (HDL), or if you are using any other dietary supplement, prescription drug, or over-the-counter drug. Do not exceed recommended serving. Exceeding recommended serving may cause serious adverse health effects. Possible side effects include acne, hair loss, hair growth on face (in women), aggressiveness, irritability, and increased levels of estrogen. Discontinue use and call a physician or licensed qualified healthcare professional immediately if you experience rapid heart-beat, dizziness, blurred vision, or other similar symptoms.